Whether you are at your desktop or using our mobile room condition reporting app for your phone or tablet, you can use uCondition. Our condition report software allows the updating of a condition, the ability to add notes, tag work order groupings and take damage billing photos. Allow students to access a copy of their digital condition form forever! 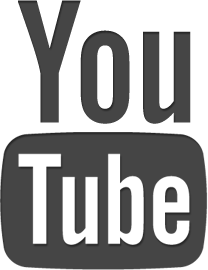 When they checkin, they will receive a welcome email with a secure link. Also, allow students to add changes or note to their RCF for a set amount of time in the event they find additional damages not previously recorded on their form. An administrator can approve or reject these edits. 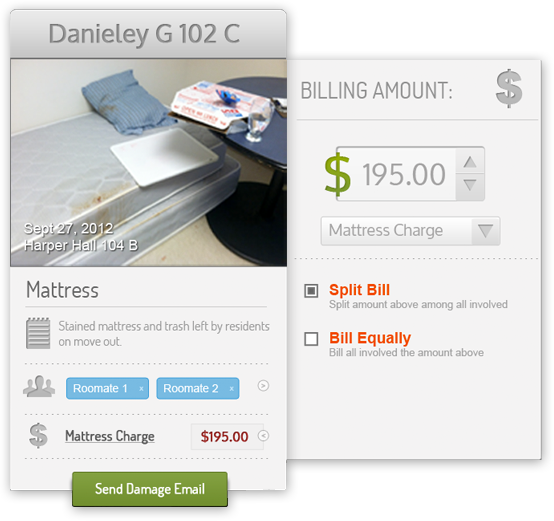 While completing your room condition reports, you can easily add notes to each element (mattress, door, ceiling, etc.) and tag your note with the relevant department (furniture, painting, etc.) to make work orders easy to track and import into your current work order reporting system. Tracking discrepancies in a room’s condition is crucial when it comes to student damage billing. As a result, uCondition has integrated photo taking capabilities into the application making it easy for you to take a picture of a damage and have it automatically timestamped and watermarked with that room name. Easily view all student damages in one place. Scroll through the photos in an aesthetically pleasing way while using the sort functionality to find visual record of the damages you are billing. Keeping an accurate record of student room damages is crucial. With our complete damage billing solution, you will automatically be able to view any and all changes in conditions from checkin to checkout. You will then have detailed options to charge the student(s) accordingly. It is truly a pain having to complete a room condition report only to turn around and fill out a work order. 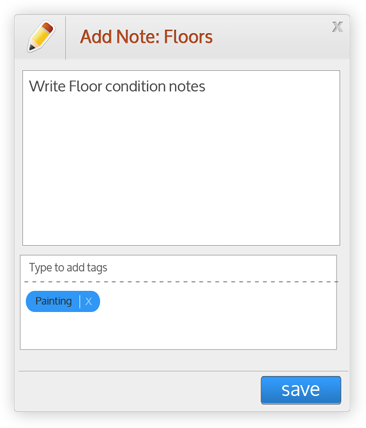 When you input a condition, you can add a tagged note that will help categorize work orders by room. uCondition bundles the work order notes in an a CSV that easily integrates with your current system for tracking facility needs and work orders on your campus.